How many infiltrators are there in Israel? 71% of the infiltrators are citizens of Eritrea (26,563). 21% of the infiltrators are citizens of Sudan (7,624). 7% are citizens of other countries in Africa. 1% are citizens of the rest of the world. into Israel, and have remained in Israel illegally – their visas long expired. Infiltrators, asylum seekers or refugees? judges also use this legal term. Asylum seeker: Only a small number of the infiltrators, 22%, are asylum seekers – i.e. they have filed a claim for refugee status on the grounds that their lives and freedom are at stake in their country of origin; their claims have yet to be reviewed. 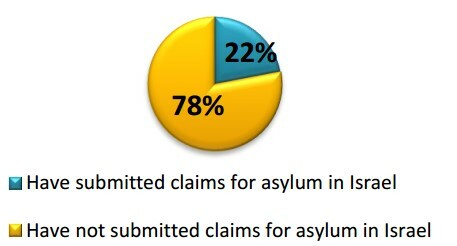 In other words: 78% of the infiltrators have never submitted a claim for asylum. a claim. Most of the claims for asylum around the world are denied. and is thereafter recognized by the state as being entitled to protection. Migration Authority, (2018). Data of foreigners in Israel, Table 2. Does Israel allow submissions of claims for asylum? Why have the claims already submitted not been reviewed by Israel? Commissioner for Refugees, and thousands took advantage of it. infiltrators have never submitted claims for asylum. Why is the percentage of recognition so low? Darfuris can return to Khartoum, the capital of Sudan, without any fear. be granted status in the near future. More about the gaps can be learnt from the data provided by UNHCR. asylum), while Austria recognized 52%. sends rescue and aid missions to disaster areas around the world, etc. and Blue Nile in Khartoum. Why are the infiltrators not deported back to their country of origin if they are not refugees? many Sudanese have already returned to Sudan. Population and Immigration Authority, (2018). Foreigners in Israel statistics. contribute to the loss of the above source of income. independently returning to their country of origin. Why does Israel deport only Africans? Is Israel condemning the infiltrators to death by sending them to a third country? District Court even criticized the evidence, calling it biased and unreliable. The Supreme Court criticized the methodology used to write the statements. order to gain status in the countries they moved onto. another country, the responsibility of the State of Israel expired.